When you return from a hard day’s work, what do you want to feel? Comfort? Relief? Home. That’s exactly what the Staybull® line of recycled Santos Mahogany flooring provides; a warm and welcoming environment that also complements your home’s upscale design. With luscious deep reds, reddish brown tones, and sophisticated grain patterns, a Santos Mahogany Staybull® floor always strikes just the right note. Own a room that uplifts, that inspires. 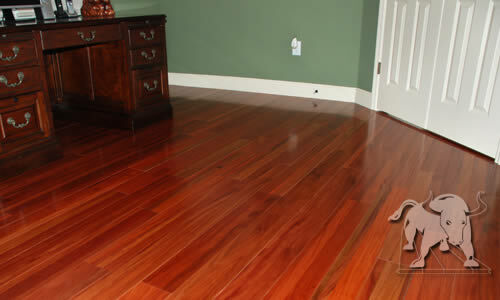 Get your free quote of eco-friendly Santos Mahogany from Staybull Flooring®. Santos Mahogany exhibits a range of color between light orange/brown with yellowish overtones to a dark reddish/purplish brown. This wood also features an interlocked grain, which gives it a strong ribbon-like pattern.